Dedicated to Hitokotonushi no kami, or literally the God of One Word, who is referred to in the Nihon Shoki Chronicles. The god only grants requests made in one word or one request for each person praying to him. Others say in his oracles he only utters only one word of good or bad. 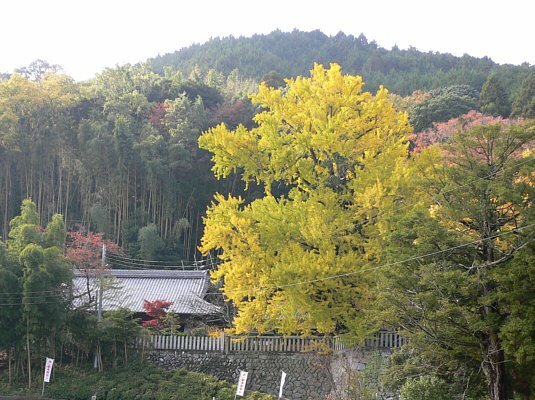 In fall, the sight of the tall ginkgo tree leaves turning yellow is breathtaking. 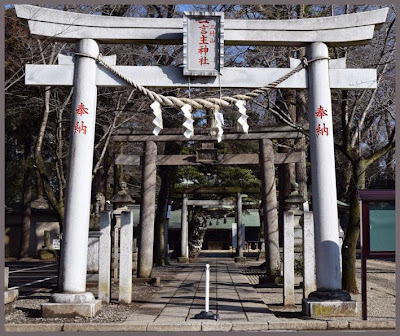 In the precinct are Kumozuka, or spider mound, whose origin is in the Nihon Shoki, and a monument inscribed with a haiku poem by the travelling poet Basho Matsuo. a deity known for its oracle powers, spreading the word of the gods among the people. 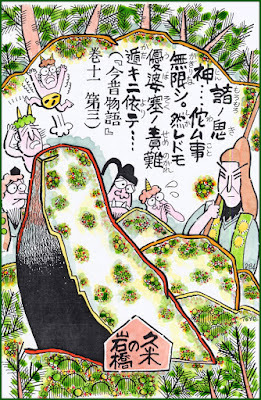 Hitokotonushi was the "God of the Rice Paddies" from Katsuragi area. In olden times, there were five famous shrines in the Katsuragi area. The word "KOTO 言" in the name of this deity means "Oracle". 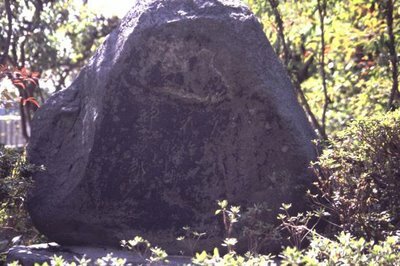 A god (kami) appearing on Mount Katsuragi, near the border of Yamato and Kawachi Provinces, and who could utter oracles of good or evil with the decisive speaking of a "single word" (hito-koto). 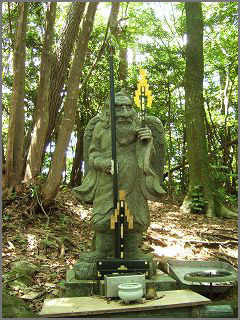 The central deity (saijin) of the Hitokotonushi Shrine in Katsuragi, Katsurakami District, Yamato Province (present-day Nara Prefecture). good in a single word." Upon hearing this, the emperor and his courtiers removed their garments and offered them to the kami. Similar stories are found in Nihongi and Shoku Nihongi; the version in Nihongi reflects ancient beliefs in hermetic mountain wizards. © Matsunaga Naomichi, Kokugakuin University. 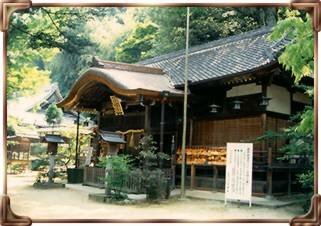 En no Gyooja (E no ubasoku) , the famous mountain ascetic around 700. He is famous for roaming the area of Mt. Katsuragi. E no ubasoku was of the Kamo-no-enokimi family, presently the Takakamo-no-asomi family. He came from the village of Chihara, Upper Kazuraki district, Yamato province. By nature he was endowed with wisdom; he excelled in learning and attained ultimate knowledge. He lived with reverence and faith in the Three Treasures. His greatest desire was to fly on a five-colored cloud beyond the sky and play in the garden of eternity with the guests of the heavely palace, lying in the flowering garden and sucking the vital force out of the haze to nourish his nature. Accordingly, in his late forties he went to live in a cave, wore clothing made of vines, drank the dewdrops on pine needles, bathed in pure spring water to rinse away the filth of the world of desire, and learned the formula of the Peacock to attain extraordinary power. Thus he could employ spirits and gods at his command at his command. Once he summoned them all and ordered them, "Make a bridge between Kane-no-take and Kazuraki-no-take." Hitokotonushi no Okami, who was very ugly, only ventured out at night to help. But the gods were not happy about the bridge building, and in the reign of the emporer residing at Fujiwara Palace, Hitokotonushi no Okami of Kazuraki-no-take was possessed and slandered him, saying, "E no ubasoku plans to usurp the throne." The emporer dispatched messengers to capture him, but they found it hard to take him due to his mysterious power, so they captured his mother instead. In order that his mother might be freed, he gave himself up. He was exiled to the island of Izu. One time his body went floating on the sea as if he were walking on land. Again, his body perched on a mountain ten thousand feet high and looked like a huge phoenix in flight. In the daytime he stayed on the island in accord with the emporer's command, but at night he went to Fuji-no-take [Mt. Fuji] in Suruga to practice austerities. As he prayed for pardon from his severe punishment and for permission to return to the capital, he lay down on the blade of an assassin's sword and ascended Mt. Fuji. Three years passed in ascetic practice after he was exiled to the island. At the turn of the eighth year of the ox, the first year of the Taiho era, he was pardoned and approached the capital, finally becoming a saint and flying to heaven. Dharma Master Dosho of our country received an imperial order to go to Great T'ang China in order to search out Buddhist teachings. On the request of five hundred tigers he went to Silla to lecture in the mountains on the Hoke-kyo. At that time there was a man among the tiger who raised a question in Japanese. The monk asked, "Who are you?" and the man answered, "E no ubasoku." The monk thought that the man was a Japanese sage and came down from his high seat to inquire about him, but he was gone. Hitokotonushi no Okami was bound with a spell by E no gyoja, and he has not escaped even to this day. E no ubasoku did so many miraculous deeds that we cannot enumerate them all. Indeed we learn that Buddhist miraculous arts are comprehensive. Those who have faith will attain them without fail. and his wife Goki 後鬼. to help him build a 石橋 stone bridge extending from Mt. Katsuragi to Mt. Yoshino. Hitokotonushi only worked during the night and hid his face during the daytime. Thus En no Gyoja became angry at the slow pace of the god's work, and threw him into a valley. The angry god then petitioned the emperor to send armies after En no Gyôja, to arrest him, claiming that the monk sought to rebel against the throne. Gyôja escaped the armies easily, flying away on his clouds, but, after they captured his mother instead, he was forced to surrender himself.
. 那智滝本前鬼坊 - Zenkibo, Nachinotakimoto - Nara .
. 四十八天狗 48 important Tengu of Japan . He is venerated as 天狗魔王尊 Tengu Mao Son at mount Tengudake. He is the boss of the 畿内七天狗 seven Tengu of the Kinai districts around Kyoto.
. 護法魔王尊 Gohoo Maoo Son . Tengu Mao Son is the boss of the Kinai Shichi Tengu 畿内七天狗 seven Tengu of the Kinai district around Kyoto. To pray for the safety of the climb to the shrine Katsuragi Jinja on top of the mountain.
. . . CLICK here for Photos - 天狗草紙 !
. 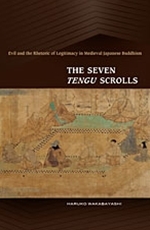 The Seven Tengu Scrolls - Introduction . "Do not be so shy, show me your face, dear God of One Word! All the cherry trees are in full bloom and everything is so beautiful here! I am sure you too will look beautiful today!" Basho was quite fascinated with the atmosphere of the place and found it hard to leave without seeing the "face of this deity". In the dawning cherry blossoms. Written in "Oi no kobumi" 「笈（おい）の小文（こぶみ）」, at age 45. 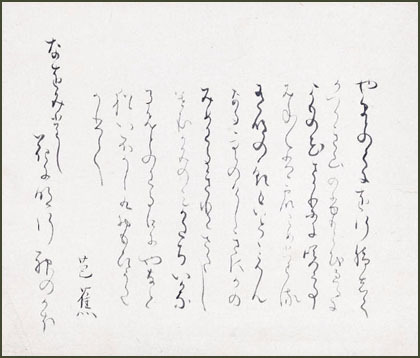 The text dates to around 1688 and carries the title Preamble and poem on Mount Katsuragi. It was written on one of Basho's many jaunts around Japan. It's presented in a wooden box, which is inscribed "Scroll brushed by the venerable Basho". "Still, I would fain see / the god's face / in the dawning cherry blossoms". 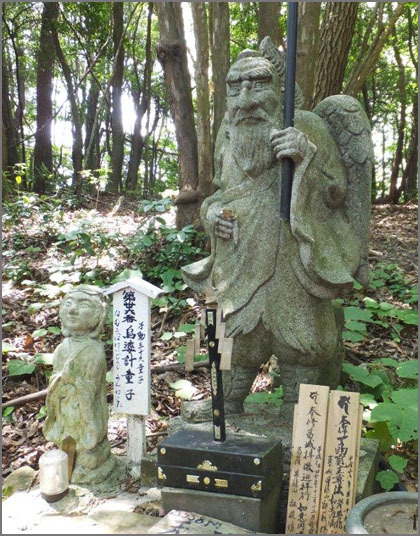 In the Japanese Shinto tradition, Mount Katsuragi is home to a kami (a kind of elemental spirit) named Hitokotonushi no kami - the God of One Word. The god's face is usually described as nightmarish, indicating just how agreeable Basho found the cherry blossoms. This poem can also be found inscribed on a rock at the god's shrine on the mountain. "The face of God", for a good Christian, might evoke the image of the old man with a white beard. Translating this "kami no kao" is really difficult. A noticeboard next to this Jizo at Rokkakudo in Kyoto says that he's inclining his neck because he's carefully considering the request made to him. However, to avoid egotism, he'll only consider one request from a petitioner so it should be a meaningful one!
. 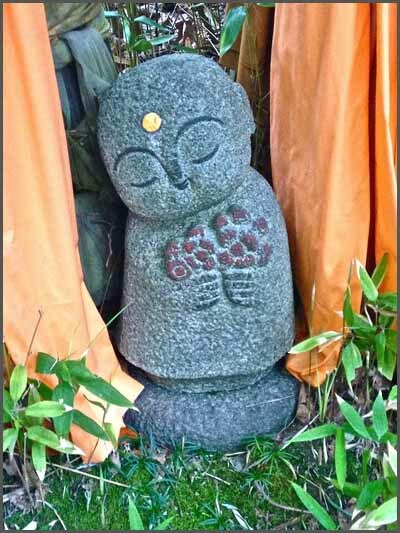 Jizō - Jizo Bosatsu 地蔵菩薩 - Introduction .
. Kannon Bosatsu 観音菩薩 - Introduction .
. Yuuryaku, Yūryaku 雄略天皇 Emperor Yuryaku . Thank you Gabi sensei for your referring to [One Word God] that lead me to Teacher Mansonge, who is famous on religious folklore. I was educated at Pre-war primary school, so my history is fully occupied with Present Emperor's system. So I am very pleased to have opened my eyes by Hitokoto God of Katsuragi . you truly re a treasure, gabi san. > so what exactly does that mean in English? "The face of god" . . . "The face of the god." one god or many gods, for two means only twice one." And maybe if we would more often look for the Divine as manifested in Nature, we would treat the environment with more respect. But that's a whole other matter. She stood in tears amid the alien corn..."
and processes: for example, Amaterasu, the Sun goddess, or Mount Fuji. Shinto is an animistic belief system." Japan, then the mention in Japanese haiku of god(s) with a lower-case 'g' should not be too confusing. However, Japanese use the same word, 'kami', for the Christian God. god, or God, is from whatever context may be provided. Shugendo: "The Way of the Yamabushi"
The question for me as a writer who writes in English is not an academic one. The Japanese of Basho as Japanese is one question. However writing in English is a completely different question, and the crucial thing for me as a reader is the art not the academics. I don't want to have to spend a year trying to find something somewhere which answers my questions as a reader in all the arguments among academics. For more than 50 years I have been hoping for a few simple answers about Basho's frog, because I have yet to see a satisfying ENGLISH version which says anything like the extensive analytical criticisms explain about the poem. "the god" however withot anything else is precious, in this poem under discussion. Translating "the god" makes me just wonder what it is I don't understand, and that is the essence of presciousness. It only leaves me realizing I am not in on the joke... an outsider looking in at a foreign special and precious inner circle of knowers I am not part of. That is what the "the" does. Standing alone without context you can not make sense of "the god" in English. If you insist that only "the god" is a "correct" translation, then to the reader, namely ME, you have to footnote it, because it leaves the whole meaning of the whole poem UP IN THE AIR!. When I translate Yunus Emre's poetry into English, I am faced with the problem that sometimes he signs his name as Yunus, and sometimes as "ashik yunus" and sometimes as "dervish yunus". An "ashik" is literally "lover" and ashiks are a specific kind of poet who sings "illahis" namely songs about the sufi way sung in "colloquial" language (actually colloquial is a genre convention but I doubt many street kids of the time would have had a clue either) and ashik poetry is always signed with the poet's name as one ultimate or penultimate verse of the poem. Ashik poems are love poems, but the subject is about tasawwuf, sufism, and it is ashik poetry which gave rise to troubadour poetry in France and meistersinger music in Germany. If you follow the academic "correct" path, believe me, you will leave me just wondering what the original REALLY says because the correct translation makes no sense. No sense in ENGLISH, no matter how correct it is. Sometimes art is more important than correctness and I have no doubt that Yunus Emre would cringe at correct translations of his poems. It is simply not fair to Yunus Emre to keep the reader up in the air. His poetry is so concrete and down to earth, that preciousness just does violence to the poetry. Preciousness does violence, IMHO, to Basho. And to haiku. The writer of haiku in English has to respect English as a language, and its literary traditions, and its literary conventions, or it becomes an exercise in preciousness. 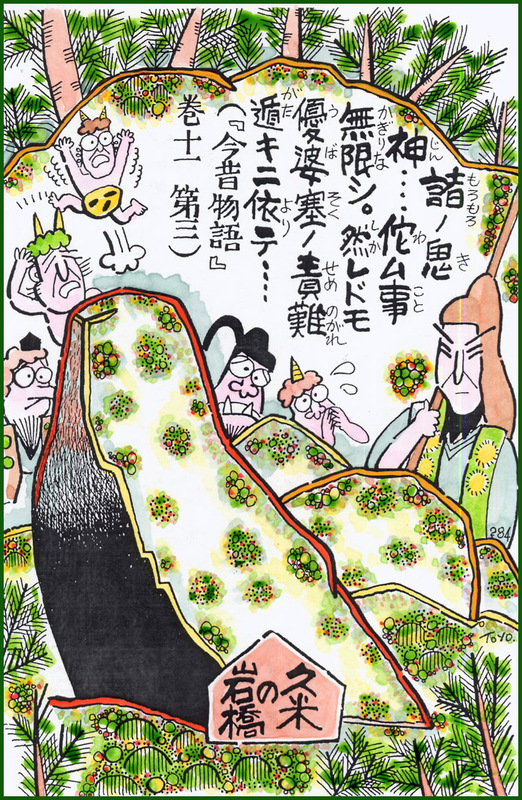 The demons Zenki and Goki once lived on 葛城山 Mount Katsuragisan and together with the Deity 一言主神 Hitokotonushi they were strong leaders of the region.